Haldane Fisher, one of the leading independent suppliers to the construction industry in the UK and Ireland, has expanded its fleet with five new Volvo trucks purchased from Dennison Commercials Ltd. of Northern Ireland. Working closely with Dennison Commercials Sales Executive, Damian Kerin, Haldane Fisher ordered a mixture of Volvo models suited to the operational needs of the business. Building on the strength of Haldane Fisher's plumbing and heating division, Plumbmaster is Haldane Fisher's new brand that that delivers an enhanced focus on the plumbing and heating sector. Two new Volvo FL-210, 10-tonne curtainsiders were purchased to offer superior service for the new brand. Each truck comes with I-Sync automated gearboxes and the decision was made to upgrade the Volvos from 7½-tonne to 10-tonne gross combination weight to achieve the maximum payload from minimum dimensions. By expanding its fleet of Plumbmaster vehicles with the new Volvos, Haldane Fisher can now offer even better and quicker service for its customers. 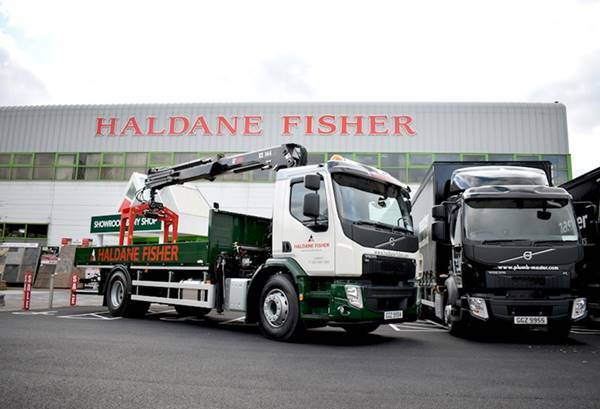 Adding to the ever-expanding fleet, Haldane Fisher have also purchased a Volvo FE-250 4x2 crane off-loader, a Volvo FE-320 6x2 rear steer crane off-loader and a Volvo FE-320 6x2 rear-steer curtainsider. The two Hiab cranes were fitted by Dennison's Bodyshop by its team of Hiab specialists. The FE models are easy to load and unload, are comfortable and spacious for the drivers and boast power and performance, combined with simple manoeuvrability. Each of the trucks are fitted with Volvo's Dynafleet telematics system and by making use of this management system it will allow Haldane Fisher to reach better profitability by showing which areas need improved. All the trucks also come with 3rd year extended warranty, part of a Volvo promotion on vehicles that are purchased outright. Commenting on the deal Colin Morrison, Transport Manager at Haldane Fisher said "We are very happy with our new Volvos. Alongside the premium product that we have just invested in, the dealer network that Dennison's can supply along with price and service, Volvo was our clear winner." The five Volvos were delivered to Haldane Fisher's headquarters in Newry, Northern Ireland in October 2017.